Socks for new born babies. Comfort for little feet. Most prospective mommies make shopping lists for their babies. And it is a right decision as in such a pleasant fuss you may forget about something that does not seem obvious, but still is a real must have for mommy or baby from the first days. Among other purchases you may forget about the socks for new born babies. 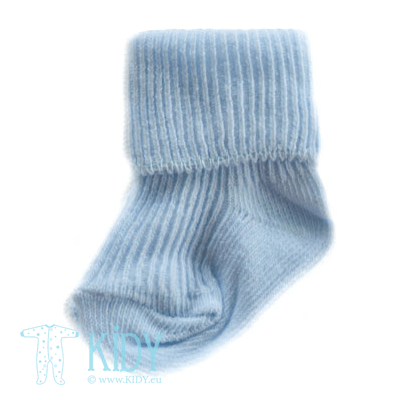 We offer to buy tiny new born socks in our online shop at attractive prices with quality guarantee. And now let us find out whether a new baby really needs the socks? Pediatricians say that a new born baby needs tiny socks already in maternity hospital as babies have high emission of heat especially in peripheral parts of the body, including baby’s feet. 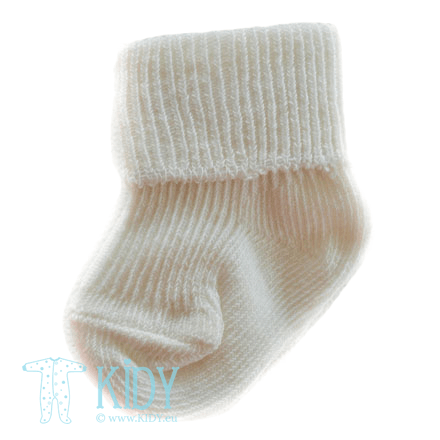 That is why it is so important to keep little feet warm and not forget to take several pairs of soft socks for your little prince or princess already in maternity hospital. 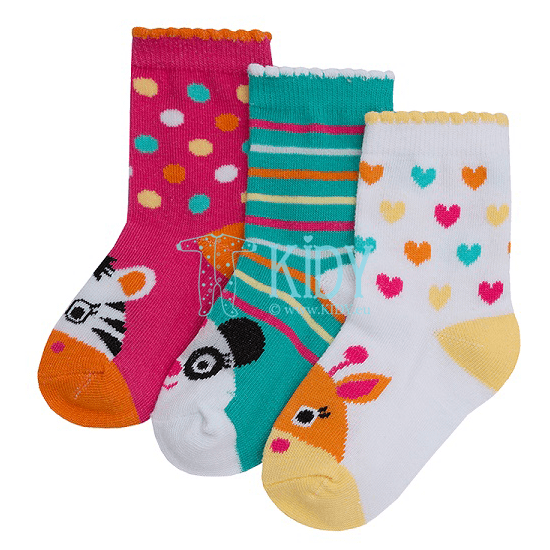 Experienced moms will be glad to tell you that socks are comfortable to use when fixing the pants on tiny feet, as if not fixed the legs might slip of the feet when a baby is randomly moving and cause some discomfort if a baby is entangled. 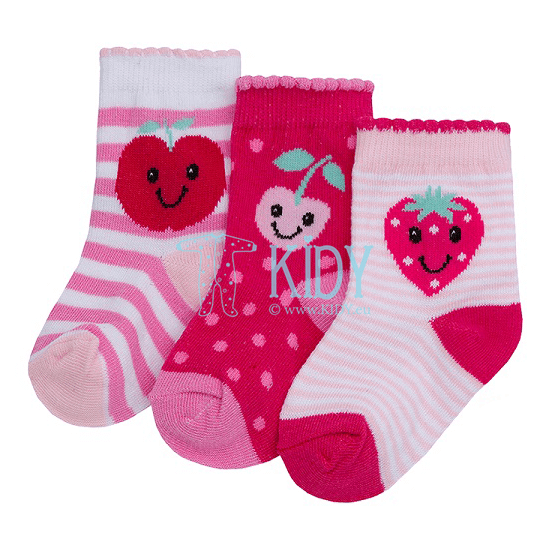 How to choose the socks for new born babies? As usual when choosing the clothes for new babies the main rule is the best quality and safety of materials used. Material. It mainly depends on the season when a baby is born. For summer you may choose thin stockinet, for winter you may need something warmer, for example, with thick flannelette inside or even woolen variants. Size. When choosing socks for maternity hospital, please choose the smallest sizes for them not to be big for the tiny feet. Usually, the sizes start from 7-8 cm. But we firmly recommend buying the next sizes at sight as the new born babies grow really fast. Elastic. No tight elastic is allowed! It might damage not perfect blood circulation of the new born baby. European elastic is the most comfortable variant for the baby. It is wide but not tight and allows fixing the sock on the foot thanks to its height. Quantity. You will surely need several pairs of each size as the babies change clothes so often! Color. For sure, it is all up to your choice but still we recommend soft pastel colors for new born babies. Where to buy socks for new born babies? 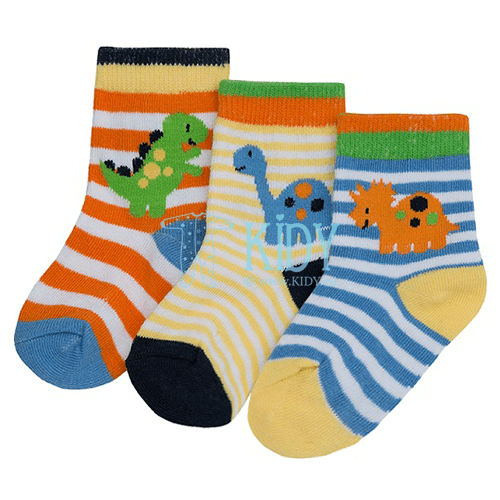 You can surely buy socks for new born babies in any retail shop but in our online shop you can purchase them at reasonable price, with fast delivery and with guaranteed quality of the best manufacturers. We are always glad to help our customers with choice and we are always ready to provide all the information about the products. 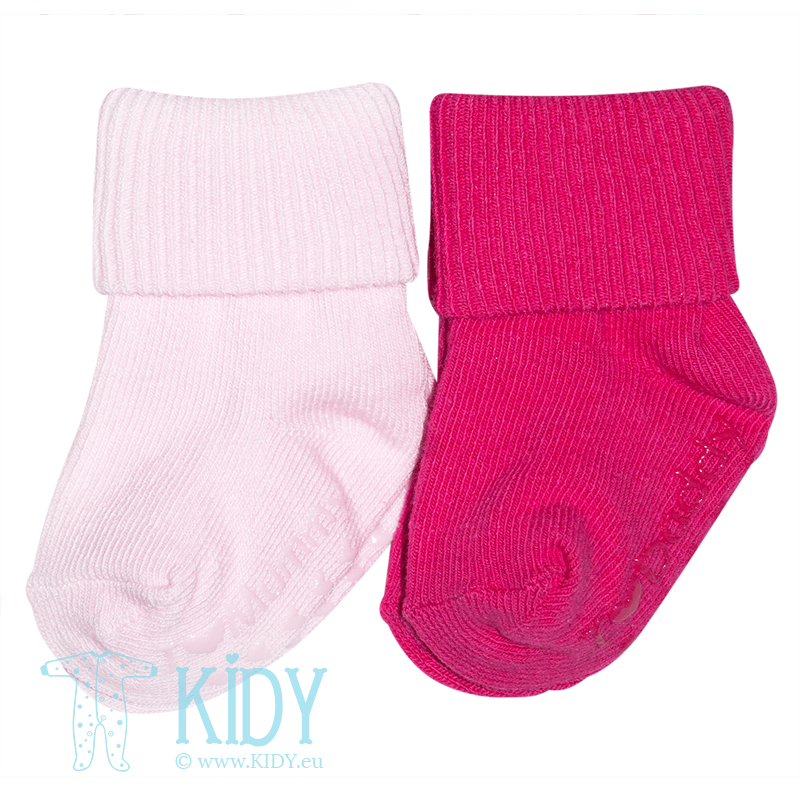 In our online shop you can buy both socks for new born baby boys and for new born baby girls. We have soft blue and pink, white and beige colors for your choice. 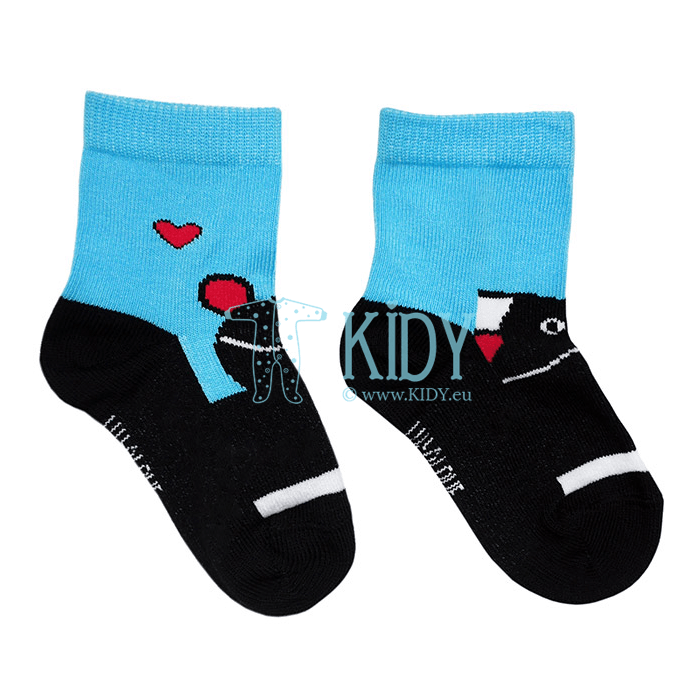 High quality of cotton together with polyester and elastane make the socks soft and flexible. 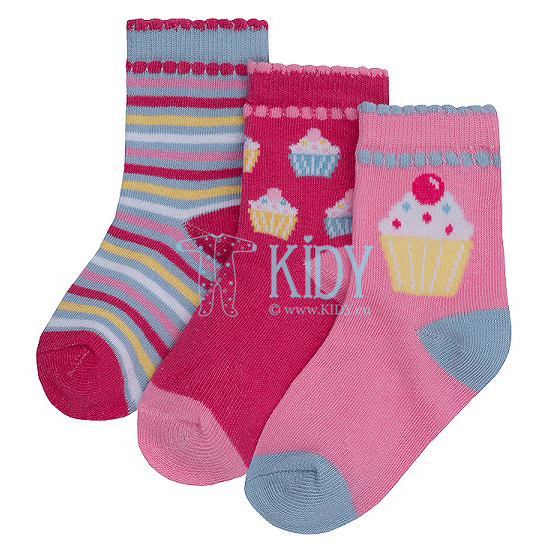 The socks have loose elastic which will not pull your baby’s foot in tight. We are glad not only to retail but also to wholesale customers. We have special offers and traditional discounts for wholesale buyers as we work directly with manufacturers and that is why we are able to offer you reasonable prices.